We spend much of our family lives in the car. Just like rules at home, car rules for children must be obeyed. We take kids to school, to soccer, to piano, to swim lessons, on playdates, and on. And on. What all this time on the road really means is that our wheels are also our home away from home. So why not make it peaceful time - or at the very least, not stressful? 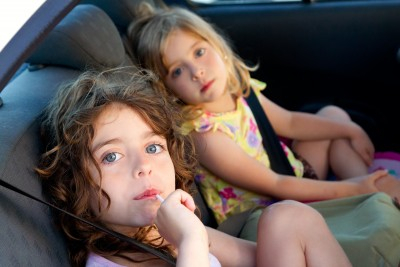 It can be done - and these 8 car rules for kids can help. Just like rules at home you can enforce with time-out penalties or the removal of privileges, the car rules of the road for children are no different. Make your car rules crystal clear - and enforce them. Yes, arguing can be legislated. Try this: Once you say "stop!" the next kid to continue to argue in any way, shape, or form loses one day of TV or other coveted privileges. Car safety dictates we don't want to try to resolve family disputes while driving. So when arguments ignite - immediately pull over. Kids know when you've pulled off the road suddenly that this is definitely not good news. Fight game over. The reason for this rule is obvious. It's the law. You can easily enforce this with younger kids by telling them - as I did when my daughter was 5 or 6 - that the car simply won't start unless everyone's seat belts are fastened. I think I got away with this until she was about 11. This one is just a good safety rule, even if you don't have a passenger-side air bag. Each child is responsible for getting his or her stuff - all of it - to and from the car. Yes, kids, this does mean you'll sometimes have to make two or even three trips after arriving home. Just like Mom.